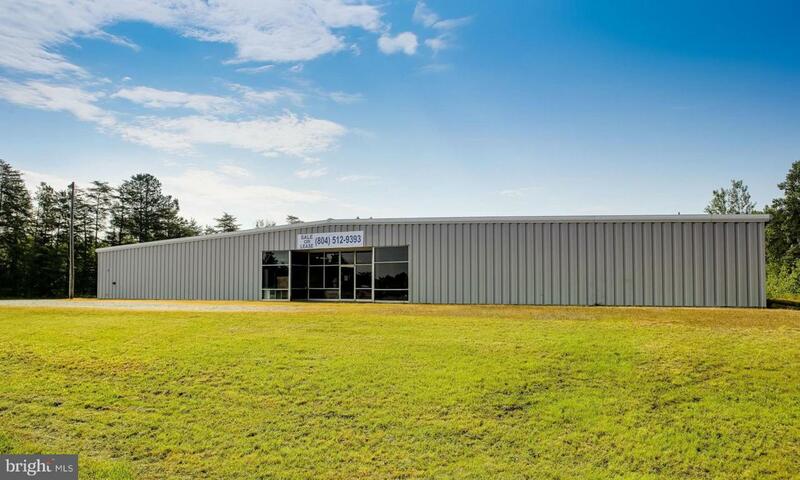 44,000 sf metal building, concrete floor built in 1972 was home to Boone's Antiques for over 30 years. Located in the Carmel Church business corridor adjoins McKesson Pharmaceutical warehousing and distribution ctr. Within sight of the I-95 interchange exit 104. Richmond 25 Mi; Wash. D.C.75 Mi; Norfolk 80 Mi and Baltimore 110 Mi all on interstate highways. Owner will lease bldg.at $1.50 / s.f. Listing courtesy of Pitts & Manns. ©2019 Bright MLS, All Rights Reserved. IDX information is provided exclusively for consumers' personal, non-commercial use and may not be used for any purpose other than to identify prospective properties consumers may be interested in purchasing. Some properties which appear for sale may no longer be available because they are for instance, under contract, sold, or are no longer being offered for sale. Information is deemed reliable but is not guaranteed. Some real estate firms do not participate in IDX and their listings do not appear on this website. Some properties listed with participating firms do not appear on this website at the request of the seller. Data last updated: 2019-04-19T10:57:04.883.